Home / Bay 13 / Will Being Captain Make Steve Smith Even Better? Will Being Captain Make Steve Smith Even Better? Michael Clarke retired recently, meaning that Steven Smith is going to become Australia’s permanent captain, the youngest since Kim Hughes. Smith is also the best batsman in the world. Could his form be about to get even better due to him becoming captain? All of Australia’s captains since Ian Chappell have been batsmen: Greg Chappell, Hughes, Allan Border, Mark Taylor, Steve Waugh, Ricky Ponting, Clarke, and Smith. It got me wondering on whether your batting form increases, decreases, or stays similar after becoming captain. Using Statsguru, I got the innings score for each batsman in their first 10 innings before becoming captain. (For those wondering, the little number in the box next to the player is the number they have in Cricinfo’s catalouging system. For example, if you go to Michael Clarke’s page, the URL is www.espncricinfo.com/australia/content/player/4578.html. And also, Kim Hughes wasn’t included because he seemed to be captain for a bit, then not, then a bit, then not, and it was confusing). So, what can we gather? Half of all batsmen increased after their captaincy began, while half decreased. Seven of the eight had a noticeably difference, with only Steve Waugh’s minimal. 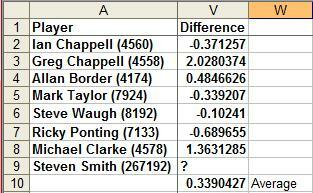 Michael Clarke and Greg Chappell both doubled their performance afterwards, in Clarke’s case tripling it. The overall increase. however, is 34% more runs. Steve Smith has scored 627 runs in his last ten innings. Based on this, he should score 840 in his next ten. Watch out, New Zealand and West Indies. Everyone's favourite teenage cricket statistician, crunching the numbers on all sorts of things. Go Renegades. Yep, still saluting. What a brilliant website.